The Mennonite Brethren are part of the larger Christian expression called Anabaptism (meaning "baptized again"). This group of Mennonites adopted Baptist principles but tried to uphold their distinctiveness as Mennonites. Their identity is founded in 475 years of witness since the Reformation. Many German Mennonites immigrated to the North America from the Russian empire and settled in Midwest regions of the United States and Canada. Some of them found the winters, especially in Canada, quite harsh and sought warmer climates. Some of those came west to Oregon settled in Portland. Mission work in Portland appears to have been especially difficult and there were many unsuccessful attempts by the several Mennonite groups in Oregon before viable congregations resulted. According to Kevin Enns-Rempel, archivist at the Center for Mennonite Brethren Studies in Fresno, California, the Portland Mennonite Brethren Church was made up mostly of Volga Germans, and was therefore culturally different from the larger Mennonite Brethren Church. In Russia, the Volga Germans were generally Lutheran, Reformed or Catholic. The Volga Germans spoke a different German dialect from the "Low German" Mennonites who mostly lived further west from the Volga. Some of these Volga Germans joined the Mennonite Brethren Church in Russia and others did so after the migration to North America in the 1870's. The Sutton and Hastings, Nebraska Mennonite Brethren Churches were made up almost entirely of such Volga German converts to the Mennonite Brethren Church. It appears that a large percentage of the Portland Mennonite Brethren Church may have come from Sutton or Hastings. This was true for ministers Heinrich Hölzer (also Helzer, Hilser or Helser), Heinrich Reisbich and Conrad Heinrich Urbach, as well as for deacon Nickolas L. Popp. The first four ministers of the church were either born in Norka, Russia or descended from parents born there. Mr. Enns-Rempel states that there is little known about the Portland Mennonite Brethren Church. The church was never large, was geographically isolated from other Mennonite Brethren congregations, was culturally distinct from the larger Mennonite Brethren Church and seems to have left behind little documentary evidence from which historians might work. 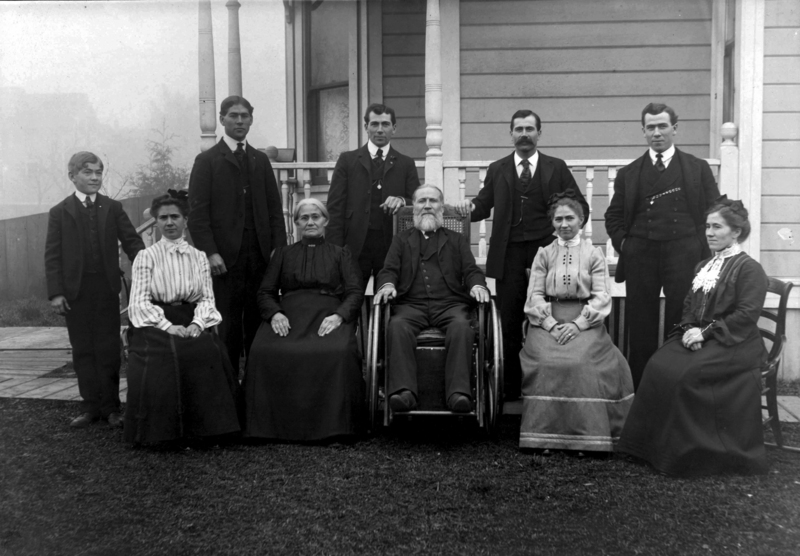 Photograph of Heinrich Helser (seated in the wheelchair) next to his wife Christina (née Ross). Standing from left to right: George Samuel, John Charles, Marnell Jack, Heinrich (Henry), Peter Frederick. Sitting from left to right: Emma, Christina, Heinrich (Henry) H. Sr., Magdalene (Lena), Christine. The photo was taken in 1900 at the home of Heinrich and Christina in Portland. Photograph and description contributed by Loretta Woodward and Marna Helser Hing. According to the limited documents that are available, the Mennonite Brethren congregation began meeting in the Albina area of Portland by 1891, ten years after the arrival of the first Volga Germans in Portland. By 1892, the church had 22 members and Heinrich H. Helser was the leader of the church. Heinrich Helser was born January 17, 1844 in Norka, Russia. Heinrich married Christina Ross who was also born in Norka. Heinrich and Christina left Norka in 1878 bound for America. They first settled in Hastings, Nebraska where they lived in a Mennonite community. The commune had a large central house surrounded by cottages. By November 1891, the Helser's had settled in Portland. Articles of Incorporation for the congregation were filed in 1893. By 1895, there were 38 church members and the group was considered part of the Mennonite Brethren home mission work. Heinrich Helser's leadership of the church ended in 1900. 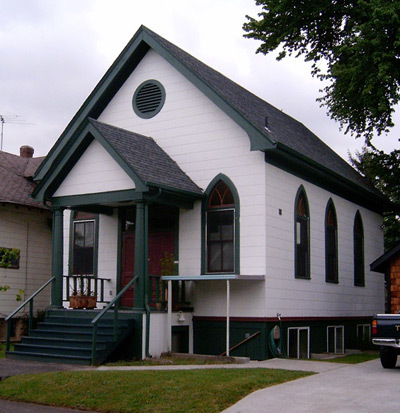 Around this time, approximately thirty-three members of the Mennonite Brethren Church decided to disband their congregation and were accepted as members of the Albina German Baptist mission, which subsequently became the Second German Baptist Church. 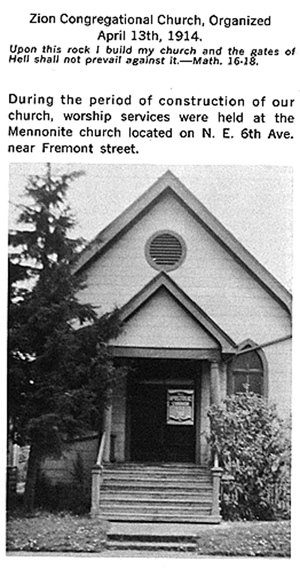 Within a short time, members of the Mennonite Brethren breakaway group became disenchanted with the Albina German Baptist Mission and formed a new congregation known as the First United Mennonite Baptist Church. New Articles of Incorporation were filed in 1901 and Johann Heinrich (Henry) Reisbich became the lay leader of the church. Like Heinrich Helzer, Reisbich was also born in Norka, Russia. In 1905, the church was located at 313 Russell (now about 70 NE Russell). A new church building was constructed at 3524 NE 6th Avenue in 1910. Membership was 37 people in 1912. Heinrich Reisbich served the congregation until 1913. This church building served as a temporary sanctuary for the newly formed Zion German Congregational Church in 1914. The Zion church was originally organized in the home of Conrad Helzer, possibly a relative of Heinrich Helser. In these early years, there were tensions within the congregation due in part to the Seventh Day Adventist and Baptist influence of some members and perhaps due to the tensions between Volga Germans and ethnic Mennonite Brethren. The congregation appears to have always struggled during its lifetime. It is remembered that a lame baker, a single man named Peter Heinrich, would regularly send a long green box with two layers of cookies home with Rev. Heinrich Voth after his weekend in Portland. According the PDC yearbooks, Peter Heinrich, who was also born in Norka, Russia, served as the lay leader of the church from 1913 until he moved to California in 1926, often with an ordained preacher or two and a deacon. By 1926, church membership had declined to 10 people. Jacob Koch began leadership of the church as a layman in 1934 and continued until 1936. In 1937, Rev. 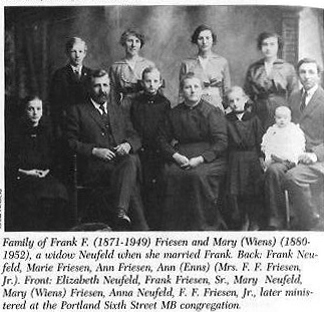 Frank F. Friesen assumed leadership of the struggling congregation, with only 24 members. Photograph of F. F. Friesen Sr. family. F. F. Friesen Jr. ministered at the Mennonite Brethren Church. This photo is shown on page 162 of the book titled "Apart and Together: Mennonites in Oregon and Neighboring States, 1876- 1976" by Hope K. Lind. The church disbanded in 1938 (its last report to the Pacific District Conference was 1937). Most of the members at that time were older people. The remaining members were advised to join the Mennonite Brethren Church in Dallas, Oregon about 60 miles to the southwest. Frank F. Friesen served as a minister for this church. For most, this was not a practical option. The records of the Second German Baptist Church note that several members of a small Mennonite Brethren Church in Albina joined with the Second German Baptist Church at this time. The PDC sold the church property in 1939 and the funds were to be held for new work in Portland. In 1940, the committee for home missions reported that they had found no new opportunities and the money was loaned to a new congregation in West Salem. Former First United Mennonite Baptist Church as of May 2004. This structure is now in use as a residence. Images contributed by Amy Neel and Jennifer Zuber. Jantzen, G. H. and Kevin Enns-Rempel. "Dallas Mennonite Brethren Church (Dallas, Oregon, USA)." Global Anabaptist Mennonite Encyclopedia Online. 2007. Web. 9 Feb 2019. 75 Years of Fellowship: Pacific District Conference of the Mennonite Brethren Churches 1912-1987, Fresno, Calif.: Pacific District Conference of the Mennonite Brethren Churches, 1987. What to see and how to see it, Portland, Oregon. Portland Chamber of Commerce, 1905.